This work can be compared with 'Listening Post' by Mark Hansen and Ben Rubin (1999-2003). It can als be compared with 'We feel Fine' (2006) and 'I Want You To Want Me' (2008) by Jonathan Harris and Sep Kamvar. All of these works gather data from the internet to provide an insight into what traces people leave behind from themselves online. These quotations are part of an online artwork, called ‘The Dumpster’. ‘The Dumpster’ is an interactive online visualization of the romantic lives of American teenagers. It is a database consisting of 20.000 postings of online blogs (posted in 2005) in which a breakup is being discussed. At least half of the authors were American teenagers between the ages of 13 and 19. And about seventy percent of the postings have female authors, while roughly fifteen percent of the bloggers are male. Although romantic breakups have the connotation to be very depressing, the postings that can be found in this database are really diverse. Similar to the quotations at the top of this article; some reactions are sad, some are ironic or even relieved. The blog posts were collected by searching BlogPulse for break-ups. Blog posts containing phrases such as “dumped me” were collected and then analyzed by a computer system that eliminated all of the wrong findings. The remaining posts were then categorized by common features such as age, gender, emotional characteristics, but also factual characteristics (like was someone in the relationship cheating?). The largest part of the design of the database consists of ‘Breakup Bubbles’. These represent the individual postings about a breakup. You can click on these bubbles, to see what has been written about the romantic failure. On the right side of the screen you will see the text appear. The breakup bubble you have clicked on, will become your ‘Currently Selected Breakup’ and turn yellow. All of the other bubbles that are similar to your yellow bubble, will try to move towards your bubble, and will also be brighter in colour (depending on how similar it is to the yellow bubble). The size of the bubble indicates the size of the text from the posting. On the left side of the screen you can find the ‘PixelView Region’. This area represents the entire database of 20.000 postings. At the bottom of the screen you can find a ‘Timeline’ showing how many breakups were found on every day in 2005. Also, the day on which your currently selected bubble was written will be highlighted in this timeline. 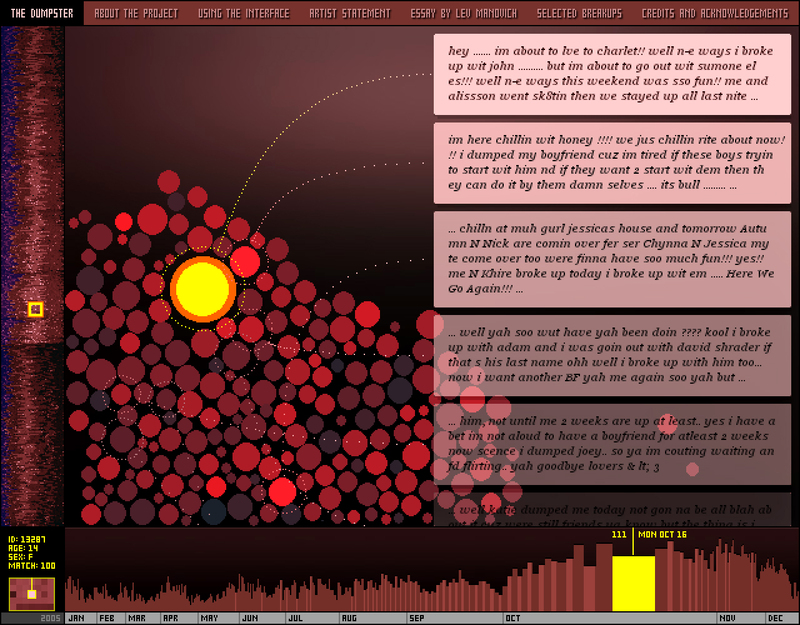 This project of information visualization also makes it possible to get a view of teen language from 2005. What’s more, we can get a glimpse of how every person’s pain is unique, but also similar to other people’s pain. Because we are all rooted in a linguistic network, we all use very similar language to describe our pain and our emotions. Lev Manovich discusses ‘The Dumpster’ in his essay, "Social Data Browsing". He points out that this artwork can be seen as a ‘social data browser’ in which: “the particular and the general are presented simultaneously, without one being sacrificed to the other”. ‘The Dumpster’ gives us the option to view every unique breakup, but it simultaneously offers a view on thousands of other breakups. In other words, ‘The Dumpster’ is a framework in which the self portrait and the group portrait come together. Ascott, Roy. ‘Art and Telematics: Towards a Network of Consciousness’ (1984). In: Edward Shanken, red. Art and Electronic Media. London: Phaidon, 2009: p. 233.